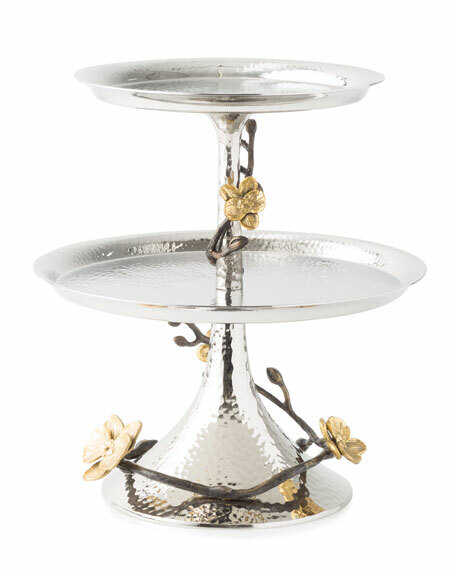 Handcrafted golden orchid two-tier etagere. Stainless steel; golden and nickel-plated hardware. Approximately, 9"T; top shelf, 7" diam. ; bottom shelf, 9" diam. The Michael Aram Gold Orchid Collection illuminates the ethereal spirit of the orchid flower. Evocative of happiness, strength, joy and resilience, the gold version of this beloved motif offers a strikingly unique appeal. Exuberant and detailed, in gold, these flowers take on a meaning that is completely unlike any other. There is a regal sense about this majestic flower, especially in gold...almost as if it has been drenched in the glowing rays of the sun. "Orchids naturally emit a sense of sensuality and seductiveness, but in gold they take on a completely different meaning...an element of radiance that I associate with positivity and optimism. When I think of gold orchids, I image this fragile flower glowing like an eternal light of joy."